Transition pages! 2 days of work for like, 30 seconds max read time, haha. Oh well, we can’t live without them. That canopy separation effect is a real thing called crown shyness, btw… nature is cool.. I probably had something else important to say, but I’ve forgotten it, so you’re off the hook. Oooh, that moon looks obloid. It reminds me of Saturn’s Iapetus. Is that on purpose? Do they have an usually shaped moon? That’d be pretty cool. Yeah, at least one of the sides should describe a circular arc. I’m not as picky as to open the page in Photoshop and check, but I’m pretty sure the left / lower arc is circular, while the right one is shadow on planetary surface. It does, I it’s literally a circle fill with a crescent masked out of it :] I’m not masochistic enough to freehand circles, haha. @shingworks Oh, I can totally see that now! I didn’t catch that faint dark outline of the rest of the moon at first. I guess I’m just more familiar with odd moon shapes than I am with our own moon’s phases. How embarrassing! 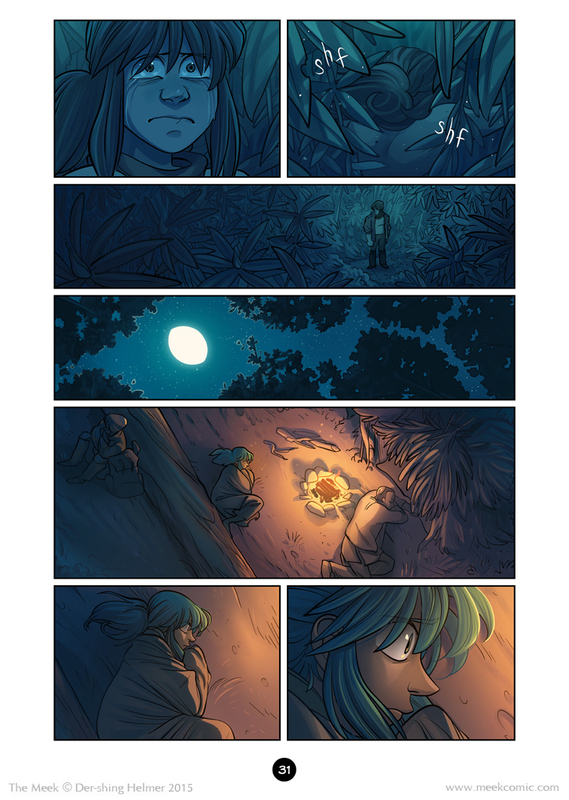 Really beautiful page. I hope you are feeling better already. Thanks, those pages are really moving. I hope you’re better or will get better soon. Ah, also, we don’t need a new vote incentive for each page… Some authors never change their vote incentive and get votes anyway. And 30 seconds read-time for hundreds of people (thousands and more if the comic stays there for years) makes a lot of time. Besides, I do read the pages twice or more if I like them a lot, and once in a while, I read all of it from the beginning again… So its really more than a 30 seconds pleasure. I could never spend /just/ 30 seconds looking at your art. ever. also I love it when you teach us stuff. I was not aware of the crown shyness phenomenon. that’s worth knowing. May–may I please hug you, Angora? Well, it is a very nice transition page. I’ve read it twice, wich made 60 seconds of enjoyable time ! I love your work. I hope that little bitterness we can hear in your (imaginary) tone will go away soon ! Obviously this page is gorgeous (because by some otherworldly power that I can’t comprehend there hasn’t been a page of this comic hasn’t been), but I have to say that crown shyness being brought up in the commentary just compleeeeetely made my day. Are those birthmarks in her back? never noticed them before. It’s one of my absolute favorites and a great inspiration to me. I am so excited to see where it’s going!! The folds in Angora’s blanket are beautifully done.